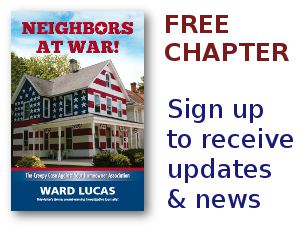 HOA Embezzlement & Fraud - Neighbors at War! I love the FBI. I love the many federal agents I have known. But my pet peeve is that the FBI, which keeps track of annual crime statistics, does not keep track of the number of Homeowners Associations which have been hit by an embezzlement by board members or property managers. Thus, it’s my belief that embezzlement from HOAs is the largest unreported crime in America. Nobody keeps track! A couple of years ago a multi-million dollar embezzlement impacted a number of HOAs in Denver. Just about every major city has suffered some kind of massive HOA theft. Good grief, Las Vegas lost more than 60 million dollars when a ring of HOA swindlers decided that HOAs were too stupid and weak to stop embezzling. Some of the crooks were among the highest and finest of society. The FBI is credited with sending 43 HOA officials, lawyers, cops and property managers to prison. But I fault the feds for not going further. This same kind of corruption infests HOAs across the country. The corruption is being fed by massive legal fees going from homeowners into the pockets of complicit attorneys. And Legislatures across America know exactly what’s going on, but they refuse to reign in the corruption. It’s all about the money. Never, ever think that money doesn’t play a huge part in keeping a corrupt system alive. The short answer to your question is, yes! I can relate. The judge ordered my HOA to turn over records. The board president declared under oath, “we have no records!” She was strongly warned by the judge about perjury and she stuck by her declaration. I contacted the DA’s office. A detective from the police department was assigned to the case. The board members told him they knew nothing because the board president died shortly after I hired an attorney. Ten months later a homeowner walked in on two board members (one being the former president that declared the HOA had no records in court) and one former board member shredding records. When I called the detective to tell him records had been found he said he had been allowed in those records shortly after the judge ordered them turned over to me. Having already spent $10K to see those records I opted not to spend more to take her back to court on perjury charges. Keep in mind…people who have nothing to hide, hide nothing. What we did learn was $10 million was and still is unaccounted for (since 2008) and the HOA had $500K in unpaid bills. Not a dime was in the reserve account. Bank accounts had been opened all over town and some had never seen a transaction. The dead president held that position for 20 years and treated the HOA as his personal business. At the time of his death he was running for the board of an HOA in Carlsbad, CA. where he had recently purchased two places. He was 60 years old. The owners have suffered the effects of property value loss of approximately 45%. The board borrowed $1,000,000.00. Maintenance was deferred to the point the structures of the housing are severely compromised on many properties. And a whistle blower working for the property manager presented photos and a notarized affidavit. The community is 25 to 30% rentals and an unknown number of foreclosures. I’ve lost track of the number of lawsuits. The HOA has also lost the insurance coverage 2 times in 3 years. The premiums are now outrageously expensive and each claim has a $15K deductible. This is proof enough to me that living in an HOA does not protect property values. I know first-hand that is pure propaganda! It has been a total nightmare living in this HOA. Unfortunately, I paid cash when I purchased. The goal of the HOA is to run up your legal bills until you are bankrupt and can no longer fight. Call your local media. Keep calling. Call your legislators if you wish to get involved in a long and laborious task of passing a bill to give you rights. Or, find a sucker to buy your place and run! Run like your hair is on fire! I was shocked when I found this come up #2 on Google “Profile of an Embezzler”. Thank you for adding that link, Chuck. So many of the things he has listed as “do not do” are done in HOAs. Since HOAs are basically a bottomless pit of money it seems there is no concern about how much goes missing. There is always more where that came from. And you are required to keep paying no matter what or they will take your home! Just more reasons to never own in an HOA!